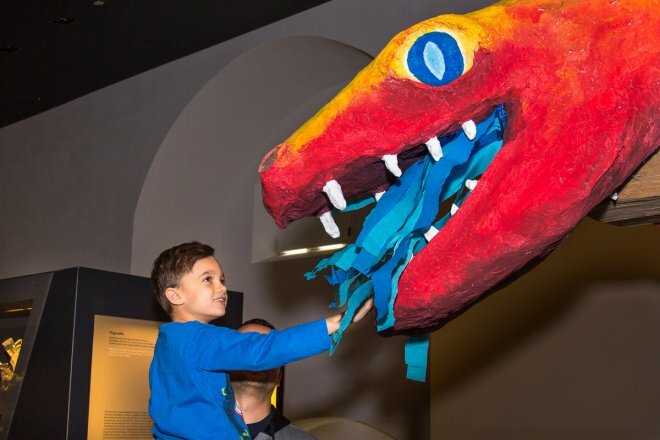 During the winter holidays, visitors to terra mineralia young and old will be setting out on a fantastical journey to the land of volcanoes with knights, unicorns and dragons. They’ll need to go on an exciting search through the mineral exhibition to help the knight and the unicorn find a new crystal horn. Visitors will be able to choose which shield or weapon the knight should have, and which of the three magical crystal horns the unicorn will wear. At the end of the search, the dragon awaits. Only he has the blue fire that can fasten the crystal horn to the unicorn’s brow. There will also be experiments waiting for the young researchers in the Voyage of Discovery, terra mineralia’s hands-on laboratory. Here, they’ll learn how crystals grow in nature, why ores are important for the knight’s armour, how and where volcanoes form and more. They’ll even be able to simulate a volcanic eruption with the volcano pump. Afterwards, kids will have the chance to make their own knight, unicorn or dragon from a template and take it home as a memento. Our “Knights, unicorns and dragons” winter holiday programme runs from 3 to 25 February 2018 every day from 10am–5pm. There’s no need to pre-book and you can start at any time. Kids clubs and day-care groups are requested to book in advance. Please allow about 90 minutes to complete the programme. For more information, please contact the Info Desk (Mon–Thurs, 10am–3.30pm) on 03731 394654 or by email to @terra-mineralia.de. Winter holiday programme "Knights, unicorns and dragons", (3 - 25 February 2018), Photo: Luisa Maria Dietrich, terra mineralia. 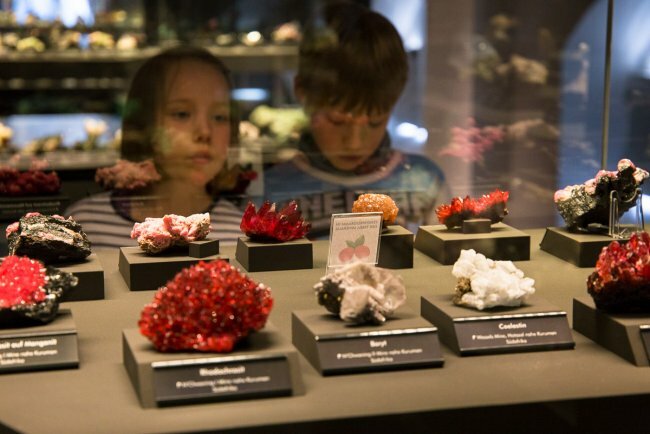 Our holiday programme, “What does that look like?”, which runs from 10 – 13 May and 19 – 27 May 2018, is all about minerals with unusual shapes. Lots of minerals at terra mineralia have extraordinary, funny and even crazy shapes: there are melons, fried eggs, cauliflowers and even an Easter bunny. Families with children and curious adults, too, are invited to search for these shapes at the exhibition. 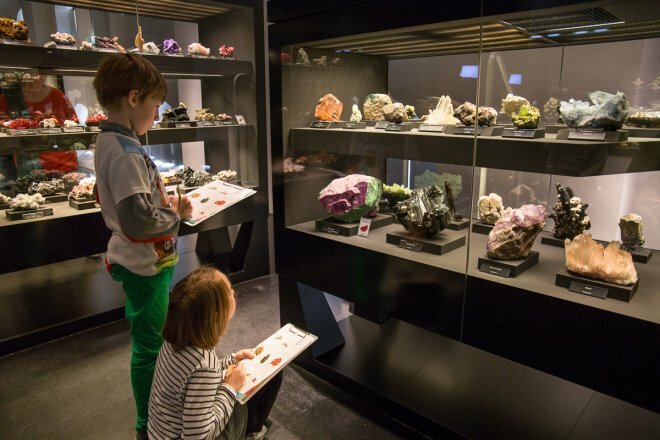 As you do so, there’ll be ambiguous pictures and other optical illusions to help you learn how your imagination can run wild, so you can find the strangely shaped minerals in the exhibition. 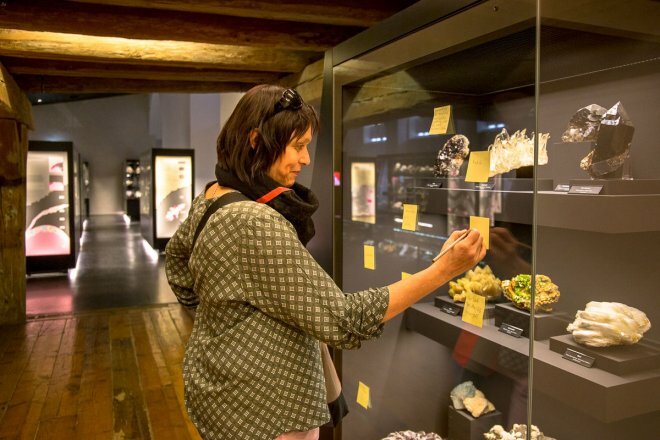 After that, you’ll have the opportunity to make your own mark in the Europasaal: Visitors are invited to write down the shape they see in the minerals on a sticky note and stick it to the display cabinet. 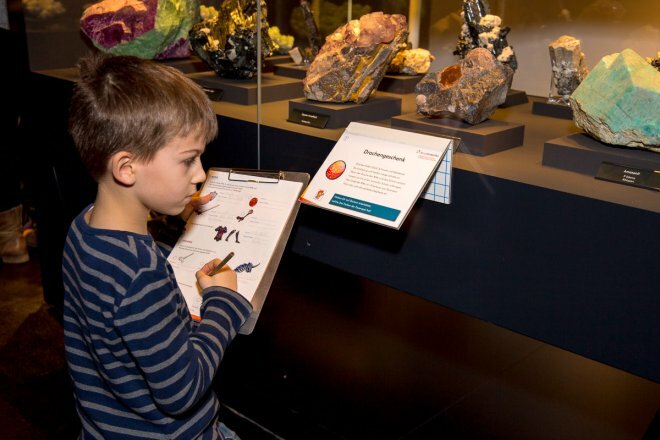 In the Research Expedition, terra mineralia’s hands-on laboratory, boys and girls can learn which forces of nature affect rocks and minerals and change their shapes. Water and wind reshape rocks and minerals with their relentless power. They even transport them over great distances. Heat, cold and plant roots have the power to spring rocks open and break them to pieces. Glaciers leave scars on rocks. 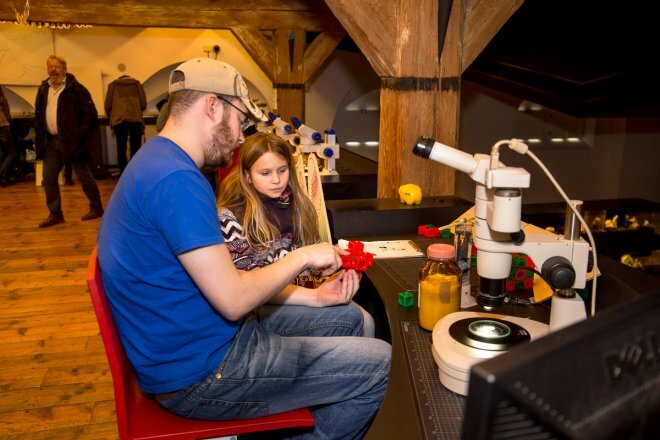 Students from the TU Bergakademie Freiberg have come up with these experiments, and others, that children can get involved in themselves. On top of that, there’s also a drawing competition for our younger visitors. We’re on the hunt for the nicest Easter bunny. At the moment, there are only two large bunny’s ears, made of calcite, on the colouring page. They need a creative head to be added. The child who creates the best drawing will win a family ticket. Our “What does that look like?” holiday programme runs from 10 – 13 May and 19 – 27 May 2018, every day from 10am–5pm. There’s no need to register, and you can start the programme at any time. Day-care groups and kids’ clubs are requested to register in advance. Please allow 90 minutes to complete the programme. For more information, please contact the Info Desk (Mon–Thurs, 10am–3.30pm) on 03731 394654 or by email at fuehrungen@terra-mineralia.de. During the summer holidays exciting discoveries are waiting around the elements in the terra mineralia in the Freiberg's Freudenstein Castle. Because the elements are the building blocks of our minerals. From the 30th of June to the 2nd of September interested girls and boys can go on a discovery tour. Seven cheeky elements tell the children in the exhibition: how they look, what colour or special quality they have. 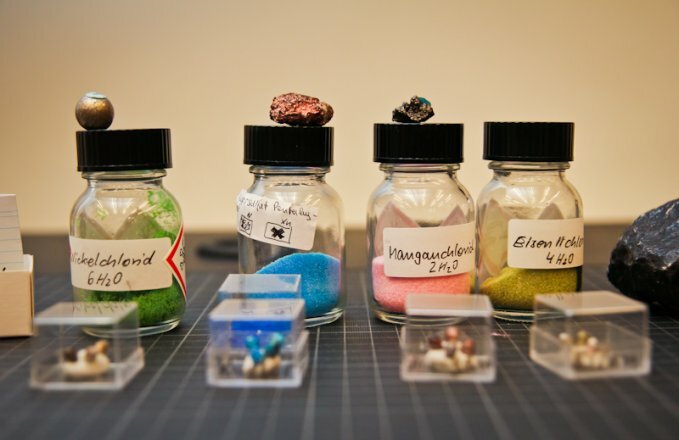 Carbon Konrad, Silicon Silke or Flora Fluor - each of the elements looks different and has special properties. Of course, together they form many different minerals and are often needed by us humans as a raw material. What would our computers look like today if we did not have silicon chips? 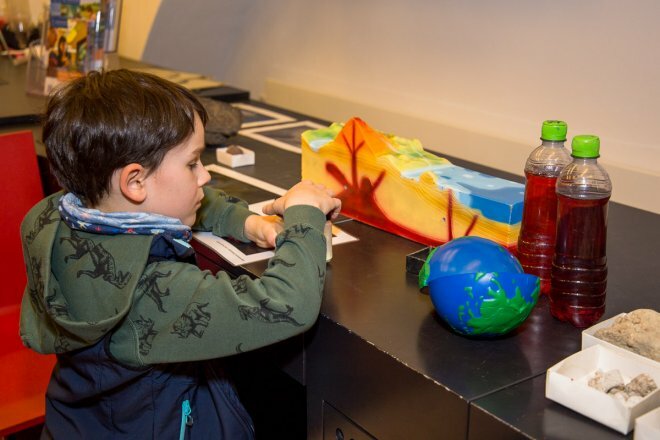 In the hands-on lab "Forschungsreise" the students of the TU Bergakademie Freiberg prepared exciting experiments on the seven elements. Here, kids playfully learn how salt crystals grow, what happens when Captain Calcium leaves the egg shell, or how many Carbon Conrads it takes to turn graphite into a diamond. The girls and boys learn from the model how the elements are constructed, what they can be differentiated and arranged. 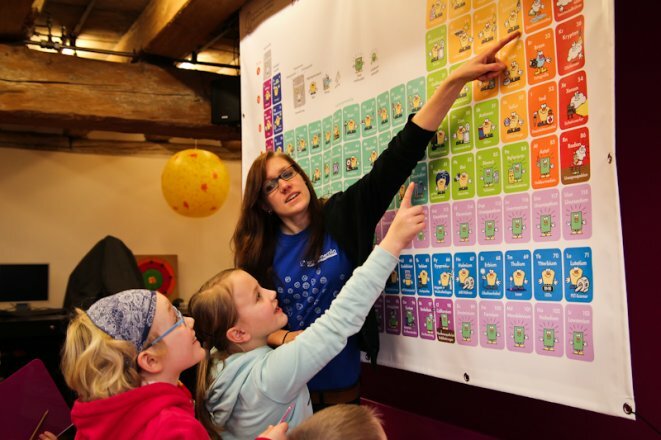 There is an extra developed, child-friendly periodic table of elements. The holiday program "The Elements" takes place in the period from 30 June to 2 September 2018 always from Thursday to Sunday, 10 - 17 clock. Children and daycare groups are requested to register. Further information can be obtained from the information desk of terra mineralia on 03731 394654 or by e-mail at fuehrungen@terra-mineralia.de. Ibexes, cactuses and geckos – which do you find where? Special exhibition “Diversity counts! An expedition through biodiversity" (18.09.2018 – 27.01.2019), Photo: Luisa Maria Dietrich. In the autumn holiday program of the terra mineralia, the girls and boys find out which animals and plants are found at famous mineral finding places in the world. The program ties in with the special exhibition "Diversity counts! An expedition through biodiversity ". Opals from Australia, gypsum from Mexico or mountain crystals from the Alps - at the famous mineral sites there are not only beautiful minerals to discover, no, there are also many animals and plants. Some of them are even so specialized that they only occur in this one locality. On their tour through the exhibition, the children look for the animals and plants of famous mine discovery sites at six different stations. Some of the animals have hidden in the exhibition, of others one can only hear the sounds. It also has to be puzzled as to what creature it is. Once the children have found the solution, they can fill out their work sheet whether the animals and plants are found, for example, in the African savanna, the South American rainforest or the Alps. 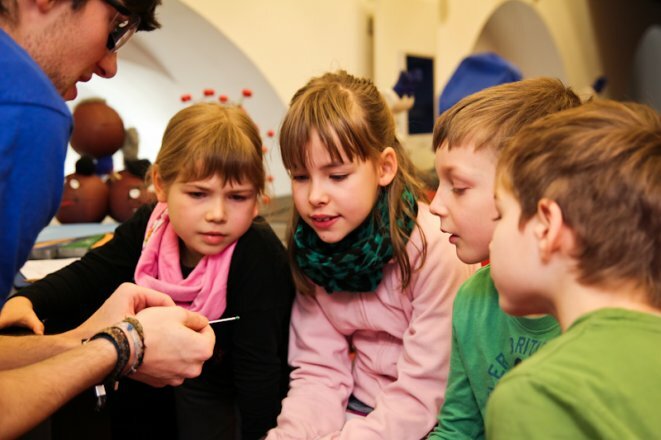 In the hands-on lab "Research Expedition" the students of the TU Bergakademie Freiberg prepared suitable experiments. They show that geological processes, such as mountain formation or weathering, have a major impact on living environments. Of course, the girls and boys can try out the experiments themselves. Mountains can be formed with colorful, homemade dough, in a large tub you can try out the power in rivers and how they change the landscape. In addition, many sand samples with desert sands from all over the world are waiting for the little visitors. Only under the microscope do they unfold their full fascination. As highlight waits from 6.-21. 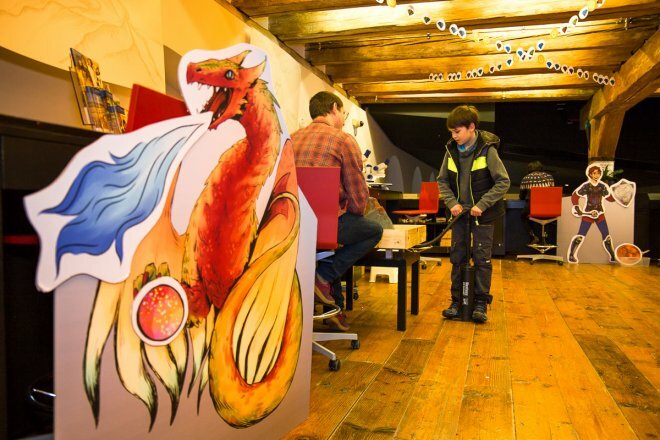 October - during the Saxon autumn holidays - the "Magic Sandbox" from the Institute of Mine Surveying to the visitors. Here a virtual world is projected onto the deformable relief of sand, so that one can simulate many geological processes, such as the formation of mountains or the course of rivers. The autumn holiday program "Capricorn, Cactus, Gecko - Who's Where?" takes place from the 3rd until 31st October from 10 to 17 o'clock. Children and daycare groups are requested to register. Further information can be obtained from the information desk of terra mineralia at 03731 394654 or by email at fuehrungen@terra-mineralia.de.